Thanks to the work of environmental activists, about 361 acres of open space in the Valley have been permanently protected from development. On February 24, the Kestrel Land Trust announced in an e-mail to its members it had saved 161 acres of forestland in Pelham, Massachusetts. Pelham borders Amherst. The land is open to the public for hiking. On February 21, the Vermont Land Trust announced in an e-mail to its members it had saved about 200 acres of forestland in the Vermont towns of Winhall and Jamaica. Jamaica is 13 miles from Brattleboro. Winhall borders Jamaica. The land is open to the public for hiking. Between 1982 and 2000, the Connecticut River Valley lost 27 percent of its farmland. That's according to a Trust for Public Land report, "The Connecticut River: Quintessential New England." Land trusts get most of their money from the government. Politicians decide how much to invest in protecting open space, versus the military or prison for non-violent people. The USA spends far more on the military than any other nation on earth, and has the highest incarceration rate. Raising taxes on billionaires is another way to save farmland and forestland. For a sense of scale, Pisgah state park can be seen on the map. 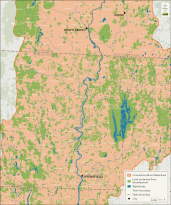 Is is the biggest protected area that is both east of Brattleboro and southwest of Keene. It is about 13,300 acres.